Member of the Founding Parliament Alek Yenigomshyan, who is in the NSS temporary detention isolation cell, has problems connected with simple living conditions. “Food, water, reading. He is alone there and it is very difficult,” his advocate Nikolay Baghdasaryan told A1+. Today advocate together with the representative of the HRD office visited Alek Yenigomshyan, who has disabilities. According to Nikolay Baghdasaryan, at present the Ombudsman’s office is dealing with those problems, but the administration cannot technically solve those problems. In the NSS temporary detention isolation cell, according to the advocate, there are no appropriate living conditions for Yenigomshyan. Besides, the documents should be provided to Alek Yenigomshyan in Braille alphabet, so that he can read and defend his rights. 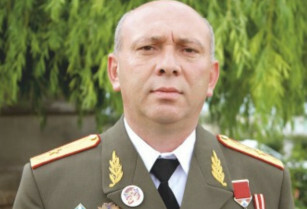 Alek Yenigomshyan is suspected of supporting the armed group, which seized the police HQ on July 17. I also don't want any land given up, or the weakening of the Armenian position in Artsakh. Yes, and the corruption in government, should be cleaned up. But, I don't see this as a good thing. What is your though on this? “At present, we have an Armenian colonel who fought to defend Artsakh, but was killed by an Armenian, as well as Armenian citizens wounded by Armenians, hostages held by Armenians, a woman among them. This seem like an Arab or South American country type of action. What do you think, any of you? Edited by onjig, 28 July 2016 - 08:18 PM. We have learned with great concern of the detention by the National Security Service on July 27 of life-long patriot, Ara Alec Yenikomshian. Mr. Yenikomshian has for decades been engaged in charitable work in Armenia and with the improvement of a country he loves more than anything else. He has devoted life and limb to the benefit of the Armenian homeland, and he was one of the closest and most trusted comrades of your former comrade-in-arms, Armenian national hero Monte Melkonian. Despite suffering great physical wounds in the process of his patriotic activities, Alec continues to work for the good of Armenia. Mr. Yenikomshian is an extraordinary patriot, conscientious and dedicated to civil debate and to the lawful, peaceful improvement of the country’s institutions. We join our voices to the many others who request that he be released immediately from police custody. Perhaps since the takeover of Bastille in Paris in July 1789, much of the humanity has chosen non-violent methods for settling political discourse. On the one hand, times were changing and the use of arms looked increasingly uncivilized even while dealing with oppressive and corrupt regimes. Besides, people knew they will fall anyway, despite a few attempts here and there to “expedite the process”. On the other hand, the development of democratic governance across the world in the subsequent centuries provided examples of smoother and much less costly transition opportunities. In a written statement, the attackers—political activists and “freedom fighters” from the war in Artsakh (Armenian for Nagorno Karabagh) calling themselves the “Daredevils of Sassoon” per a medieval Armenian heroic epic poem—mentioned that they were left without options to channel dissatisfaction with the handling of the country’s affairs and achieve a meaningful change in the country’s governance. Every single nation-wide election in Armenia since 1991 has been considered fraudulent by independent observers, with the one in 2008 leading to 10 deaths of protesters daring to question the outcome. Policy Forum Armenia’s research since 2008 confirms this. Demands of the gunmen are straightforward: (1) release of all political prisoners, including their leader Jirayr Sefilian (Lebanese-born highly decorated field commander of the first Artsakh war) and (2) resignation of Serge Sargsyan and his regime. The statement issued by the Presidential palace on the 5th day of the events in response to these demands read much like an ultimatum of someone, who has difficulties grasping the new reality on the ground. It essentially said to the gunmen: “Lay down your arms and you will be tried by the country’s laws and Constitution.” Although some senior members of the junior coalition partner and a key Sargsyan ally in suppressing Diaspora dissent—the socialist ARF-Dashnaktsutyun—criticized the use of force by the group, few took them seriously, coming from a party that has been charged by an Armenian court for preparing to assassinate country’s first (and only) legitimately elected president in 1993.
International response to the police compound takeover has been strong. Both the US and the EU condemned the use of force by the attackers while at the same time calling on the regime to exercise restraint in handling the situation. The Russian Foreign Ministry condemned the takeover of the police base and called on the authorities to “unblock the situation as soon as possible, release the hostages, carry out a full investigation of the incident and punish the responsible persons”. In the meantime, the public support for the gunmen has been gaining momentum despite the regime’s intimidation tactics, mass arrests, and use of force. A committee has been created—consisting of opposition politicians and independent intellectuals—to coordinate the activities of protesters in coordination with the attackers (who have cut a deal with the police to have communication with the rest of the world). The outpouring of support from Diaspora communities—largely spearheaded by the Armenian Renaissance network—continues, with rallies (albeit still small) held in some cities abroad. This is turning into a significant challenge for Sargsyan (and his ARF propagandists), something that he cannot easily resolve without putting his political career and/or life on the line. The regime has moved full force—including using tear gas, stun grenades, and hundreds of plainclothes officers—to suppress the protests that erupted in Yerevan. Over 200 activists are reportedly in police custody following the clashes with riot police and protesters on July 20. The leader of the Founding Parliament (FP), the political wing of the “Daredevils of Sassoon”, is in hiding with a case pending against him. Another senior member of the FP, Garo Yegnukyan, has been arrested and charged with aiding the gunmen. The Transparency International Armenian Anti-corruption center has asked for a cease of all foreign funding to the Armenian police amid evidence of serious abuse of power and brutality. Events in Yerevan demonstrated a clear disconnect between the rhetoric of Serge Sargsyan’s administration and the reality on the ground. The disastrous economic and social policies conducted by Sargsyan administration (which nevertheless made a few on the top very wealthy) and constant promises for political reform followed by a series of fraudulent nation-wide elections, altogether fueling the belief that nothing can be changed in Armenia via political discourse. Moreover, the dissatisfaction with the handling of economic and political affairs of the country (which are seen as the main factors behind Armenia’s crippling emigration) was recently exacerbated by the discovery of massive embezzlement of funding within armed forces during the 4-day war with rival Azerbaijan in April (which ended with minor territorial losses for the Armenian side), creating a serious dissatisfaction with the regime’s handling of nation-wide affairs. The events also revealed an apparent disconnect between the army and police in Armenia. The former has been increasingly nervous about the Russia-orchestrated plan to hand over the territory liberated by Armenia in the 1991-94 war back to Azerbaijan (as issue mentioned repeatedly by the gunmen in their statement), in what is widely believed an attempt by president Putin to lure Azerbaijan into the Eurasian Economic Union. The police, on the other hand, is believed to be primarily concerned about the growing internal instability and continues to remain loyal to the Sargsyan regime, which has provided them with all perks, including overblown size, relatively high and stable salaries, and ability to go unpunished for rampant abuse and (highly profitable business of) covering up corruption by high-ranking officials, among other misdeeds. Armenians have not had their Bastille—they have been too busy confronting external enemies for pretty much as long as they existed, without paying much attention to the enemy from within. This might just be their chance to have it, a chance to break the vicious cycle of squandered opportunities and the continuous fall into oblivion by standing tall and calling for better governance and independence from a foreign rule. Regardless of whether or not these events will directly bring about a political change in Armenia, one thing is clear: maintaining the status quo in Armenia for Serge Sargsyan and his Diaspora partners will be next to impossible. The 30-odd heavily armed and experienced fighters surrounded by thousands of sympathetic civilians in downtown Yerevan are unlikely to go away (without creating a mayhem for the Sargsyan regime) and may just become the trigger for both political and foreign policy reform that citizens of Armenia have been longing for. Mr. Yegnukian is also an Executive Board member of Policy Forum Armenia. Leader of the Democratic Homeland party, Petros Makeyan, condemns the inhuman, Pinochet-style actions of the security forces. “Police officers with machine guns intimidate people nowadays. It is useless to keep police troops today, they should be sent to the army,” Mr Makeyan told journalists on July 29. He says the authorities are not responding to the demands of the Sasna Dzrer because Serzh Sargsyan wants to benefit somehow from the present situation and delay the surrender of lands. “The crisis should be resolved in a political way, rather than by force. When people go to war, they realize that they will either die or come back home. But when the members of the Sasna Dzrer group stormed the police HQ, they knew that they will either die or be sent to prison,” he said adding that the problem cannot be solved by neutralizing the armed group or sending its members to prisons; new groups will emerge who will also raise their voices in protest against the authorities. Eduard Mkhitaryan, a member of the “Gala” political board of Gyumri, in an interview with Aravot.am, considers an absurd to file a criminal case about the fact of detecting a folding knife in the pocket of the President of “Asparez” Journalists Club in Gyumri, Levon Barseghyan, and arresting him. “The allegation is groundless and absurd. Perhaps, 91 percent of Armenia’s population have a knife like this and use it for cutting cheese, opening a bottle on the way to going somewhere or stops on the way to eat bread on the trunk of his car, every man keeps such a knife with him. They have not found any other way but to bring such accusations. The purpose apparently is clear to everyone. Isolating Levon Barseghyan from Khorenatsi Street, deprive his of the opportunity to speak from the tribune as the authorities also understand that Levon Barseghyan has very sharp and rich vocabulary and is able to criticize the RA authorities and the whole system full of corruption and illegalities, as well as the legal system armed with truncheons very precisely and very opportune, he is able to interpret the situation precisely. Levon was isolated for this very reason. I think that they have no grounds to keep Levon Barseghyan and will release him soon,” – said Eduard Mkhitaryan. According to our interlocutor, if we had followed by the logic of the authorities, then at least 60 percent of our population is a law-breaker and should be detained. “For example, the farmer goes to harvest with a scythe, or the woodcutter goes with an ax, likewise they can be detained. All this is funny, ridiculous, there are far more effective methods, you can talk to people rather than use such brutal methods, like let’s say, Arsine Khanjyan was forcibly transferred without understanding and without realizing who she is and how important she is for the community and the world culture-admiring society. This caused a big fuss. Many prestigious Canadian and American media addressed this issue. I am sure for hundred percent that they will also write about Levon, the reports of the human rights organizations will address this issue, and naturally, it will have a negative impact. It is very possible that tomorrow or the day after tomorrow, they will be deprived of financial sources, we know very well that the police are partly funded by the grant programs of international organizations. The shining helmets or, let’s say, the new measures, conscript that stand before the people, those water cannons, which they used to “shower” people, this is done by the funds of international organizations. Now, they appeared in a non-beneficial situation,” says Eduard Mkhitaryan with confidence. On Tuesdays, July 26, three French-Armenian organizations (Renaissance Arménienne, Charjoum le Mouvement and CollectifAzatDzayn) gathered in front of Armenian embassy in Paris to support the struggle of the Armenian people. In solidarity they denounced rampant corruption in Armenia and voiced support of the people in their determination to remove the current regime, restore equal justice for all, fight against poverty and restore freedoms. In addition, the organizations denounced the arbitrary arrests of citizens and demanded the release of jJrair Sefilian and Alec Yenikomishian. YEREVAN. – Actions of “Sasna Tsrer” group is an _expression_ of despair, well-known Canadian-Armenian actress Arsinee Khanjian said in an interview with the Armenian service of RFE/RL. Earlier Arsinee Khanjian was detained from Khorenatsi Streert where supporters of the group are gathering for 12 days. In her view, the change of power in Armenia should not happen through “Sasna Tsrer” group, but through the call of the people. “In fact, today, people are no longer afraid. Even if the police intimidate people, they are not ready to be afraid anymore. They are trying to become a party to the changes like our heroes,” she said. YEREVAN. - Clashes have started now between the protestors and policemen in Yerevan’s Khorenatsi street, where supporters of Sasna Tsrer armed group have gathered. Immediately after warning the policemen started an attack, throwing smoke grenades at the people, Armenian News - NEWS.am correspondent reports. The law enforcement officers have started detaining people. By blocking the street the police are moving forward, freeing the street. Clashes have also taken place in Sari Tagh neighborhood of Erebuni district, where part of the protestors have gathered. The police used special means in Sari Tagh. According to Deputy President of Heritage Party Armen Martirosyan, the clashes were provoked by plainclothes provocateurs. Armen Martirosyan and Levon Barseghyan calmed down the situation in Sari Tagh. They are negotiating with Yerevan Chief of Police Ashot Karapetyan, who insists that the assembly is unlawful and demands protestors to leave the territory. walk back to the city center. too dangerous for its participants. clearly aware that they are assaulting reporters. smashing his camera and tearing off his ID badge. safety through another Sari Tagh street. Arayik Khandoyan, was wounded,” he said. taken to the nearby Erebuni hospital afterwards. Lambarian but could not recognize the other man. that is why were are returning fire,’”Avetisian said by phone. “If there are no doctors here they will shoot us one by one,” he said. [on Wednesday,]” she told RFE/RL’s Armenian service (Azatutyun.am). demands are met,” said Stepanian. in support of the opposition gunmen. forces, police spokesman Ashot Agaronyan said on Facebook. were hit in the legs by snipers after emerging from the station. demand freedom for an opposition figure arrested in June. held nearly daily in the evening. In the most egregious campaign of human rights violations since the falsification of elections and referenda, the ruling regime has rounded up and physically attacked hundreds of citizens, including journalists, for exercising their constitutional right of assembly. Many of the late-night arrests were conducted by plain-clothes policemen with the application of unprecedented violence. Among those arrested were Heritage leaders Armen Martirosyan, Hovsep Khurshudyan, Susanna Muradyan, and Davit Sanasaryan. Their whereabouts are unknown. We demand the release of all political prisoners and the resignation of this administration, which has proved to have nothing in common with the civilized world and much in parallel with Yanukovich and other despotic, totalitarian regimes around the world. Without protection of civil and human rights, both within the country and by the international community, the opportunities for discourse and justice will vanish, and our promising new republic will risk spiraling unpredictably into formless chaos. We suggest that all political forces and civil society stand together for the purpose of establishing, in short order, a constitutional state based on free and fair elections and a fundamental respect for the dignity of each and every citizen. Armenia's Ombudsman Arman Tatoyan mentioned in his statement received by ArmInfo that facts were registered of Police hindering those detained overnight from meeting their lawyers, and breached their right to make telephone calls. The statement stresses that this is a harsh violation of human rights. Currently the representatives of the Ombudsman's Office are visiting police departments for ensuring the activists' rights are restored. To note, there is still no information about the exact number of the detainees. “Dear compatriots, I want to inform you that during past 3-4 days, negotiators have visited me, whom I know and respect. They visited me after having met with Serzh Sargsyan. The negotiators visited me for two times and once called and conveyed that Serzh Sargsyan hasn’t changed his stance and continues to claim that the guys should lay down the arms, after which meeting will be held between them. I told them that I also remain committed to my stance that the goal of my meeting with the guys is to find political golden mean. First I should meet with the guys and then with Serzh Sargsyan, only as a result of that the guys can lay down the arms. I continue to insist on this stance. Not coming to an agreement with Serzh Sargsyan in this matter has had serious consequences for our people, for which I am very sorry. The whole nation is in a bout, and Serzh Sargsyan wants to make it sink. Not coming to an agreement by him and using cruel methods against the people can prove it. On the contrary to all this, as well as on the contrary to the insidious actions carried out by the regime against Sasna Dzrer and the people, I remain open for negotiations, which aim at stopping bloodshed as soon as possible. “I strongly condemn the actions of the policemen and non-uniformed people, who left the impression of gang members carrying out inadequate and incorrect actions against protestors, especially the journalists,” Aram Abrahamyan, Chief Editor of Aravot daily said during a press conference commenting on the events at Sari Tagh neighbourhood. “They targeted the journalists and attacked them to interrupt live broadcasts and destroy photos, videos and recordings, so that their actions would not to be recorded. However, as it was also proved during the Electric Yerevan that’s impossible,” he added. According to Abrahamyan, whatever happened was revenge against the public and the journalists, which is strongly condemnable. Concerning the issue of how the news are being edited in this critical moments, Mesrop Movsesyan, the director of A1+ news agency, who was also present during the press conference noted that the editor and the journalist discuss what should be broadcasted. “Yet when they’re trying to close your mouth, cut off your tongue, break your hands and the camera, it becomes difficult to think about how to edit [the information]”. Speaking about whether the journalists are protected when carrying out their professional duties and whether they can leave the scene when their safety is endangered, he noted that professional journalists never leave. “I’ve visited our reporter, Robert Ananyan at the hospital. While having numerous injuries, he wasn’t scared. He worked about an hour while bleeding”. IT security expert, Samvel Martirosyan also condemned the attacks highlighting that applying such means in an inhabited area is incomprehensible. “Attacking journalists is a serious case. After the events at Baghramyan, the journalists’ community wasn’t consistent enough in order for the real culprits to be punished. So now we see the results. The journalists’ community shouldn’t just express their joint opinion, rather they need to resort to certain actions”. Speaking about blocking the news, he said that pursuing journalists the issue wouldn’t be solved, as anyone with a cell phone is a potential journalist. “We have thousands of journalists today who provide information from the scene. It’s just that many of them aren’t professional”. They also noted that in response, journalists could refuse to cover certain areas.